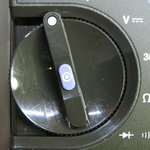 To re-install the knob, place the pointer in the VAC position to avoid damaging the tiny plastic end stops. Push down on the knob, applying even pressure until it snaps back into place. This entry was posted in How-To and tagged 70-series, DMM, Fluke. Bookmark the permalink. Found one of the stops already broken on a Fluke 73. How would you fix it? With a small self-tapping screw, like this. After installing, I ground the head off with a rotary tool to make sure it doesn’t interfere with normal rotation. Embarrassingly, I’ve never thought about doing this. I’ve just been living with it. Toughest part is to find a screw that tiny in the junk drawer. Good morning, my name is Salvatore, I write from Italy. I need the knob of the fluke 77 multimeter. You can send a single knob? Thumbs up on the video. It’s like you know all my little tricks. Take care of the 77, and I bet it will give you another 25 years of service. I have three Fluke 77 multimeters, but they are the 1st of the series. Two of the three need repairs. I have found the pdf file for the Service Manual on your site, but it is a bit different than the 1st series. The one on your site is for Series 11 (two), if I am not mistaken. Do you know where I can find a pdf of the series 1 Fluke 77 that would include schematics, parts lists, etc? I am also finding difficulty in locating replacement parts, such as “fusible resistors”. R2 is a .36 ohm 2w fusible. I don’t see that value on the series two schematic, for example, much less find the part anywhere. It may be easier if I am looking at the correct documentation, if I can find it. I have read some of your information on R1, and may be able to locate that one. I think the part number for the service manual I am seeking is 731034, but I am not sure if there is a schematic and parts list with that manual. Thanks for the informative website! I’m not sure where you found a copy of the 70 series II models on my site. I generally link to official versions if I can find them. There is a copy of the 70 Series I service manual in my share directory, I must have put it there because it doesn’t appear to be in the official Fluke manual archive. Anyway, if you reference the above manual, there are three schematics at the end covering early versions of the 77, including the early unfused 10A versions. R2 is a 1 Meg-ohm 1W resistor. It is in the ohms voltage sense path. sorry for the confusion on a number of issues here. I think I found the document under “Fluke 87 Fusible Resistor” under the comments section. As it turns out, one of my Fluke 77 models is a series two anyway, and the schematics appear close enough to figure out differences on my earlier models, which both need R1 replaced. So, now I am looking for 1k, 2w “fusible”. May I ask how I can determine if resistors are “fusible” in my search? Just “MF” (metal film) does not specify if a resistor is “fusible”…Or does it? My understanding is, “FLM PRF” (flame proof) may make that specification, but I am unsure on this also. (I also found that it is R20 that is .36 ohms, not R2. R2 is as you correctly state). Any help very much appreciated. “Metal film” does not mean flame-proof or fusible, it’s just a common means of constructing modern resistors. As opposed to wire-wound or carbon composition, for example. “Fusible”, “flame-proof”, and “fail-safe” are all terms I’ve seen that describe the class of resistors we’re talking about. The basic idea is that they are designed to fail OPEN after some definite amount of time dissipating power above their rating. The “flame-proof” descriptor apparently refers to a coating on the resistor that keeps it from igniting into flames. Whether these terms are all interchangeable I cannot say with 100% confidence, but from reading data sheets, it does at least seem that way. Sorry I can’t make more definitive statements, but I’m not a design engineer. Thank-you for your time and sharing of knowledge. It has been a big help to me ! Hi, What a fantastic site this, i would be gratefull if you could please on my problem. Fluke 75 found R1 open so replaced but now, on every range i just get all segments come up, so i presume its not coming out of self test. Have you any ideas what it could, not even a bleep when changing ranges. Am only a novice, any help really appreciated. Hanging on the POST (power-on self-test) can be caused by a lot of things. If you haven’t already, download the service manual for your model, there are trouble-shooting tips in there. Check for bad solder joints (it happens) on U1. I use a popsicle stick or plastic spudger to press around and look for a reaction. Also check the rotary switch, especially the bottom wafer that controls the function codes. Dear Modemhead, do you know where I can find spare parts for the Fluke 70 series? 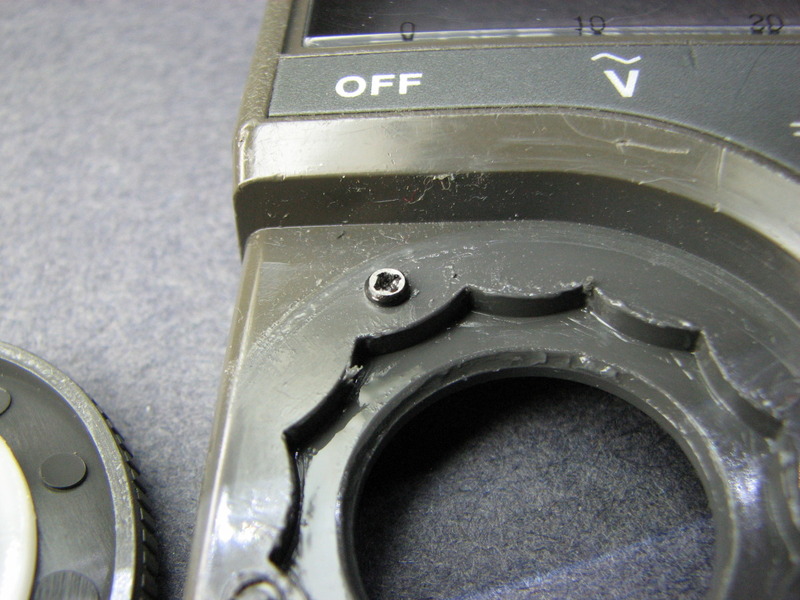 In particular the selector switch, which needs replacement (broken in the center). Your best bet is to find a “parts unit” somewhere, eBay, garage/yard/boot/estate sales, etc.